​1916 - John Sergeant is born in Manchester. 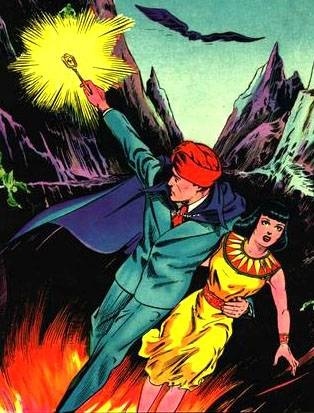 ​1930 - 14-year-old John runs away from home to travel with Ibis the Invisible, a stage magician. ​1935 - 19-year-old John starts his own traveling magic show as Sargon the Sorceror when Ibis retires. ​1938 - 22-year-old John comes into possession of the Ruby of Life. His Homo Magi ancestry allows him to unlock it's powers, granting him clairvoyant & transmutive powers that he uses as a part-time hero. 1943 - 27-year-old John predicts the Nazis attempt to open the Hellfonts of the 2nd Shadowpact. 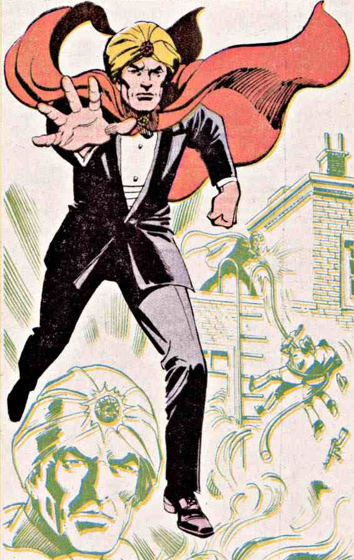 His desperate attempts to bring the news attention draw the attention of the Phantom Stranger. He participates in the 3rd Shadowpact and is immolated, but they are successful. Building the Third Shadowpact actually created an interesting conundrum: Nazi's were an obvious choice as the evil that needed to be defeated, and the characters available to craft the spell are pretty obvious. The challenge came from the fact that the specific characters available are regularly regarded as some of the most powerful characters in the entire timeline: Phantom Stranger, Doctor Fate and the Spectre? With that much might, how do you make that story interesting? The solution was to humanize the quest to even GET those characters together. That's the role we've designed Sargon the Sorceror around. While there's a pretty neat-looking modern version of the character, The legacy of Sargon isn't quite unique enough to justify adding the extra character. As he is, Sargon is one of an entire generation of characters that were mimicking the success of the Mandarin. To illustrate just how much they're all carbon copies of each other; this lower picture isn't even Sargon, it's Ibis the Invincible, and entirely magical character in a turban, suit and cape. We've used the name Ibis in Sargon's backstory, but ultimately these characters are so very hard to differentiate from each other, we've just made the executive decision to combine them.